Verdict: Absolutely not recommended for sophisticated people. ‘Seven and a Half Dates’ is a sham, reminiscent of Nollywood from the early 2,000s. Don’t waste a Kobo on it in cinema. This is a potpourri of forceful comic scenarios, amateurish story-telling and just a-little-above-average acting performances that is sure to leave you feeling regretful and irritated through most of it. In fact, the only thing worthy of genuine laughter were perhaps the antics of Toyin (Aimakhu) Abraham’s character and even that does go stale very quickly. Yet beyond that, there’s just not much else here to justify paying a premium for. ‘Seven and a Half Dates’ tells an all too familiar story Nollywood has been telling for decades- focusing on the ills of domestic violence. And though it remains an important story worth re-telling, especially for the times we live in, ‘Seven and a Half Dates’ fails woefully at it. Lazy and unimaginative, the producers essentially just coupled together rehashes of some weathered Nollywood staples. “Weathered” meaning that these scenarios have all already been so significantly over-recycled that it wasn’t surprising seeing them continually fail to impress. 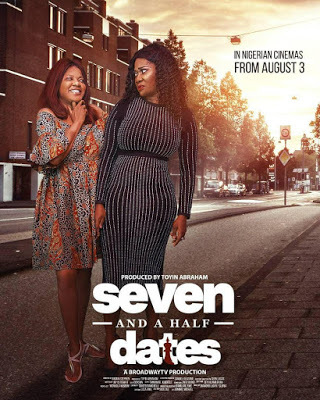 Synopsis: Seven and a Half Dates follows the life of a young hard working lady, Bisola, who is engrossed in her passion for her career and finds herself in a seemingly unending quest for love. Her father, Mr Gomez, comes to the rescue and inspired by the game of chess, sets Bisola up on ten different dates which he hopes one of them yields a good prospect. Starring: Mercy Johnson, Toyin Abraham (Aihmaku), Sola Sobowale, Frank Donga, Jim Iyke. This is crappy. And awfully stale. Avoid it!